Part of the awesome team that helped make this year possible. Last week, we ran our 5th annual Cypop for Tots fundraiser. Every year, we can’t imagine that this raffle with humble beginnings could possibly get any bigger than the previous. And every year, we’ve been proven wrong. Hands down, this has been the biggest year to date, bringing in over $50,000 ($52,500.87 to be exact) in 24 hours for the Marine Toys for Tots foundation. Because this yearly tradition couldn’t happen without such generous support, it’s fun to do a little recap to let everyone see the impact of their contributions. Plus, given that we run this entire fundraiser inside of 48 hours (one day for the raffle, and one day for shopping), it’s great to take a moment to reflect and try to answer the question, “WHAT JUST HAPPENED? !” Spoiler alert: awesome stuff happened. 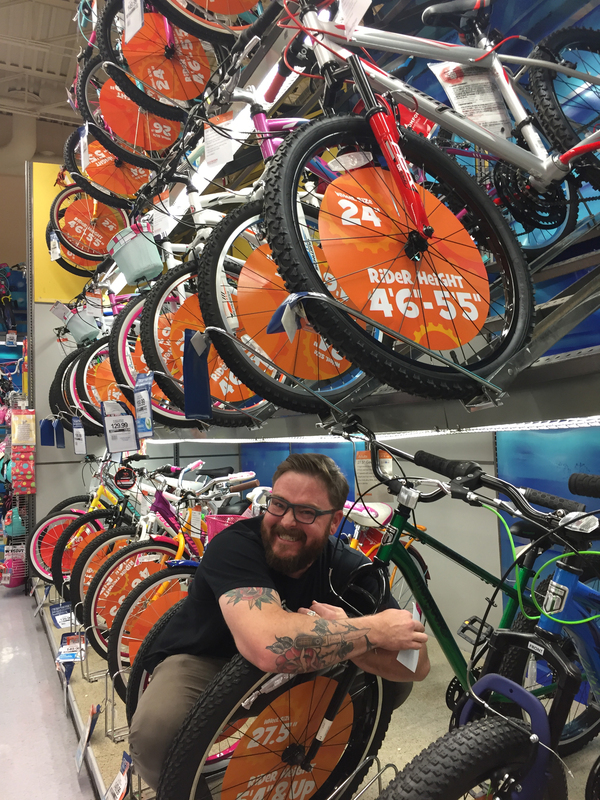 For the past two years, we’ve run Cypop for Tots out in New Mexico, with donations going to Albuquerque and neighboring towns. This year, after the birth of our first child, we picked up and moved ourselves and our business to Massachusetts. Not only were we eager to give back to kids in our new community, we were hoping that we’d raise enough to be able to donate on a national level as well. After opening the Cypop for Tots raffle on Saturday afternoon and watching the donation amount climb higher and higher in record time, we decided that we should get an early jump on our shopping and went to The Red Balloon Toy Shop in Orleans, MA. As small business owners ourselves, we love the idea of supporting other small businesses in our community. 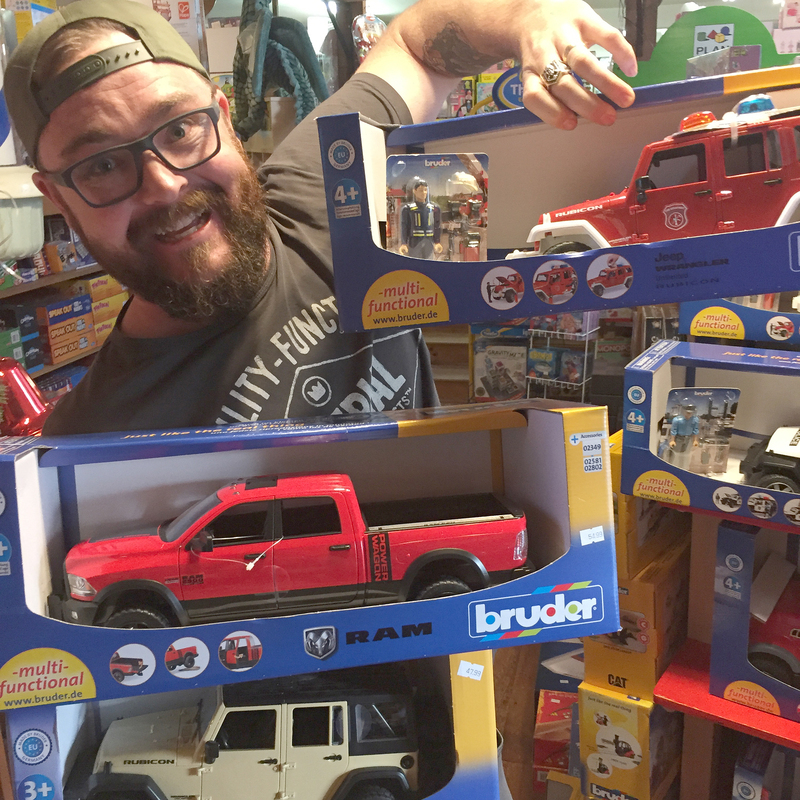 The Bruder trucks were awesome. We bought as many as we could grab. 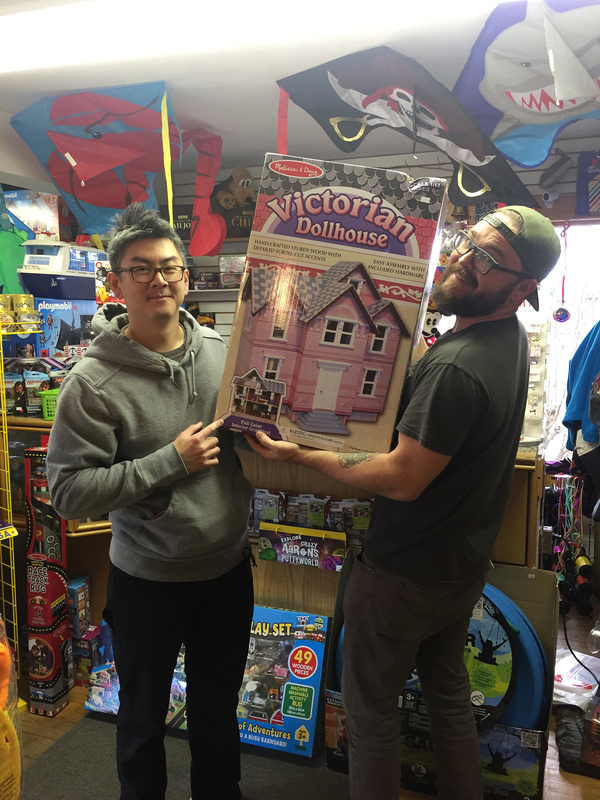 The fellas couldn’t resist this awesome Victorian Dollhouse. Star Wars. Joe’s happy place. The Red Balloon carries some exceptional and high-quality toys and the staff there couldn’t have been more helpful. What won’t break? What’s popular? What’s educational AND fun? I remember shopping there as a kid and always dreaming of being able to buy everything in the store. It was one of those rare instances of expectation living up to reality. Many thanks to the helpful staff at the Red Balloon Toy Shop! Our little elf, Barlow, was pretty tuckered out from all the fun. On Monday morning, the day of the BIG shop, Luc woke up to a phone interview with Carl Stevens of WBZ radio in Boston. Later that day as we arrived at Toys R Us in Hyannis, we did another with Walt Perkins of 95 WXTK Cape Cod. In the grand scheme of things, we know that we’re a small grass-roots contributor to Toys for Tots. But, if there’s a chance we can broaden our reach and get the word out about the organization, Luc will stand in front of ANY camera or microphone to make it happen. 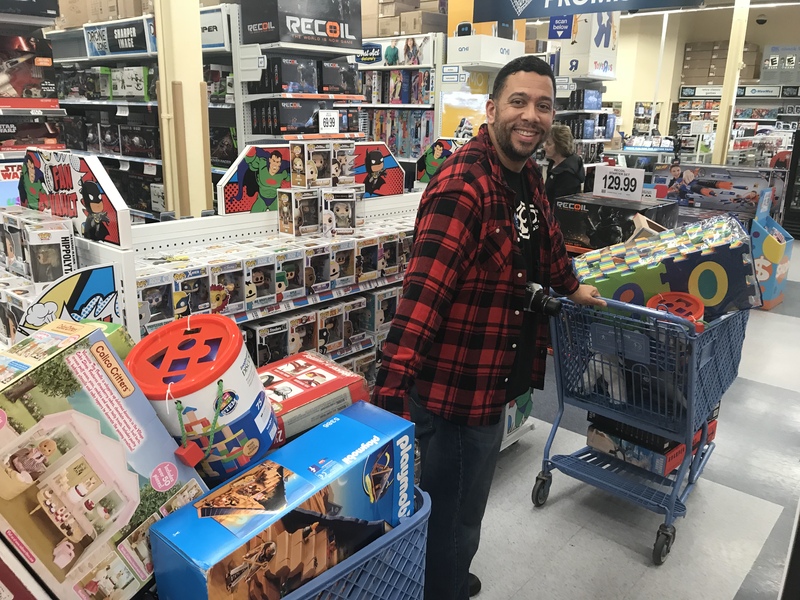 At Toys R Us, we were grateful to be met by some local Brawlers (members of the Burnley Collector’s Club) who offered to help us navigate holiday shopping madness and transport toys. Thank goodness for awesome friends with pickup trucks! 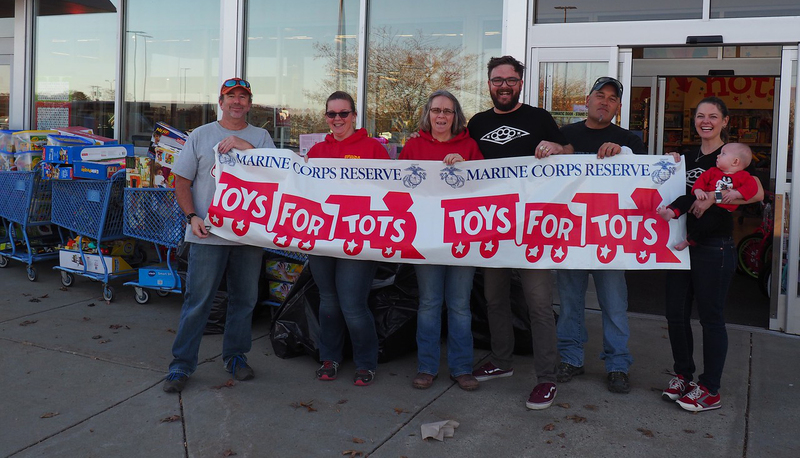 We had also reached out to Toys for Tots representatives in Massachusetts a few weeks prior and they were great about helping us understand their distribution logistics and the local need. Armed with the knowledge that the local Toys for Tots contingency was very much in need of baby toys and toys for tweens, we devised a plan on the fly and grabbed our carts. Helmets are required by law in the state of Massachusetts, so we picked some pretty cool ones that received the Barlow seal of approval. After 5 years, you’d think we’d have this whole toy shopping thing down to a science. 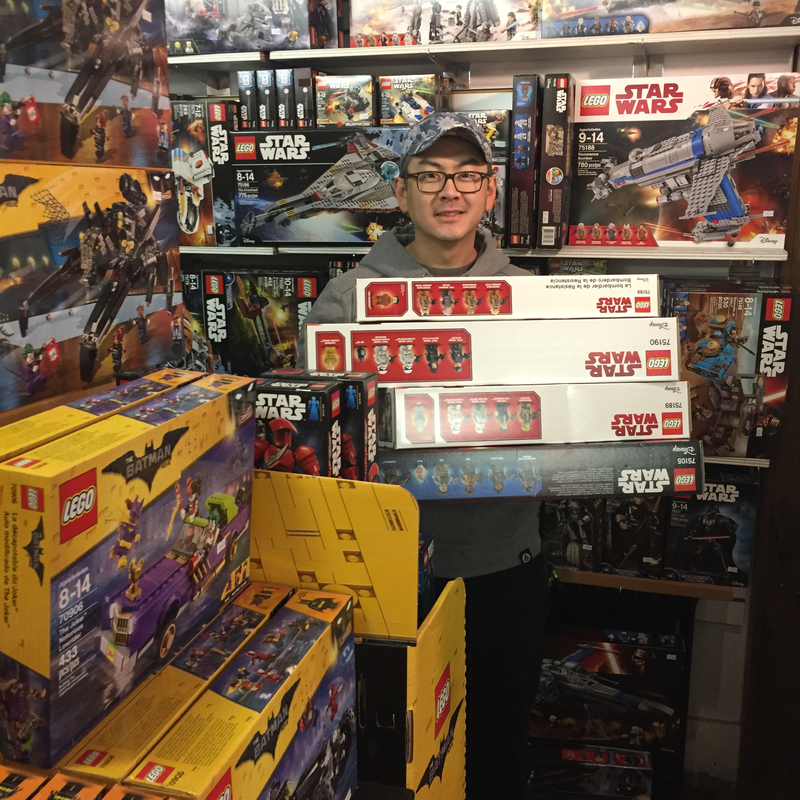 While we definitely are more dialed than we were back in 2013, something happens to your brain when you walk into a toy store and…oh look…LEGOS. With a baby on my hip and 5 shoppers to wrangle, I felt like I could barely keep up to try and take pictures. 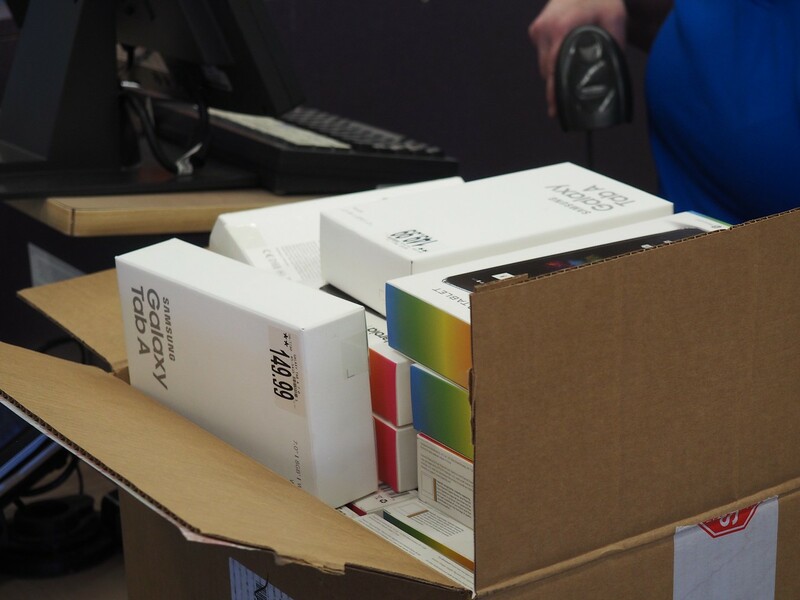 It’s easy to get ahead of yourself and end up with overfilled carts and arms. 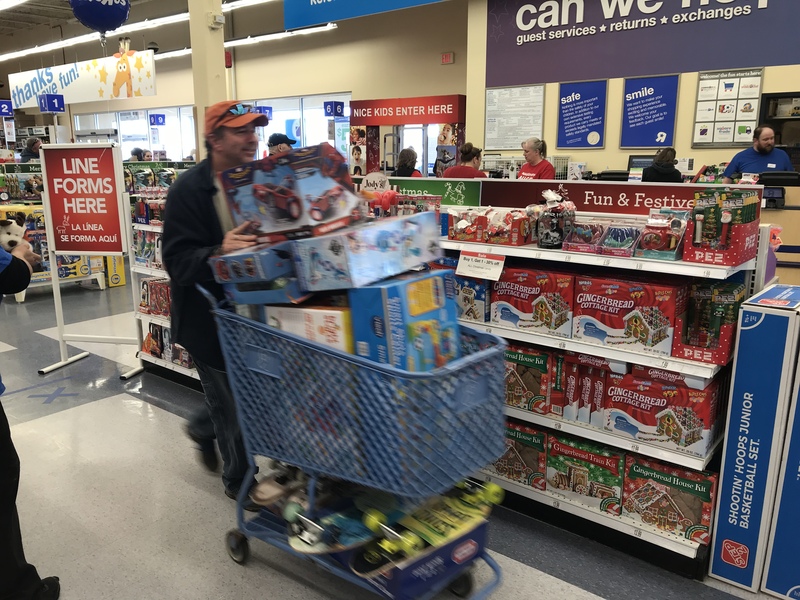 Passing Bruce in the aisles, “Got another $680 in this cart!” Passing Peter in the aisles, “I’ve got kids who are 6, 10, and 15 so I’ve got the inside track on what everyone is looking for this season.” Passing Jeremy in the aisles, “…” Jeremy was all business, head-down filling up carts like a pro and taking pictures. Jeremy manning a two-cart haul. Bruce coming in hot with another cart. 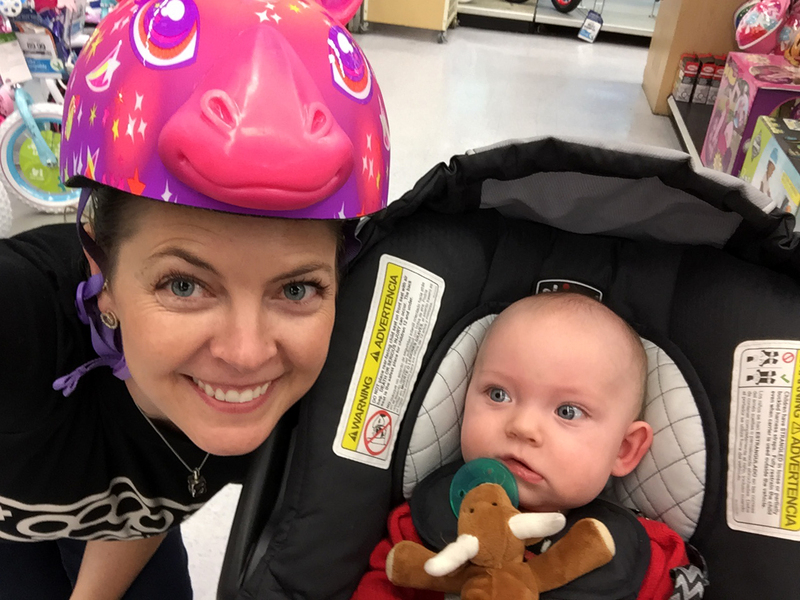 It felt like we went through Toys R Us in record time, and when we all finally reconvened and took stock of the carts we had amassed at the front of the store, we were amazed. Every year we learn another insider trick and information to help us improve our system for the following year. Next year we were told to come back to Toys R Us before the doors open so that we can have free reign of the place without bumping into other shoppers or causing a traffic jam. The reason we shop on our own is twofold. Not only does it allow us to show all the contributors how their donations were spent and make more people feel like part of the process, but it’s also because Toys for Tots has a $29.95 cap per toy while purchasing, and we don’t. So, we can buy some of the really special larger gifts that are great for families with multiple kids, foster homes, churches, etc. Tablets, iPods, and awesome Kano Computer kits for kids who like coding. These are some of the highly sought-after bigger ticket items we’re able to purchase for older kids. Whether the donation is big or small, we recognize that the money individuals contribute to our Cypop for Tots raffle is hard-earned and given generously. With that in mind, we always try and make that money go far and pick high-quality toys that will last families a long time. 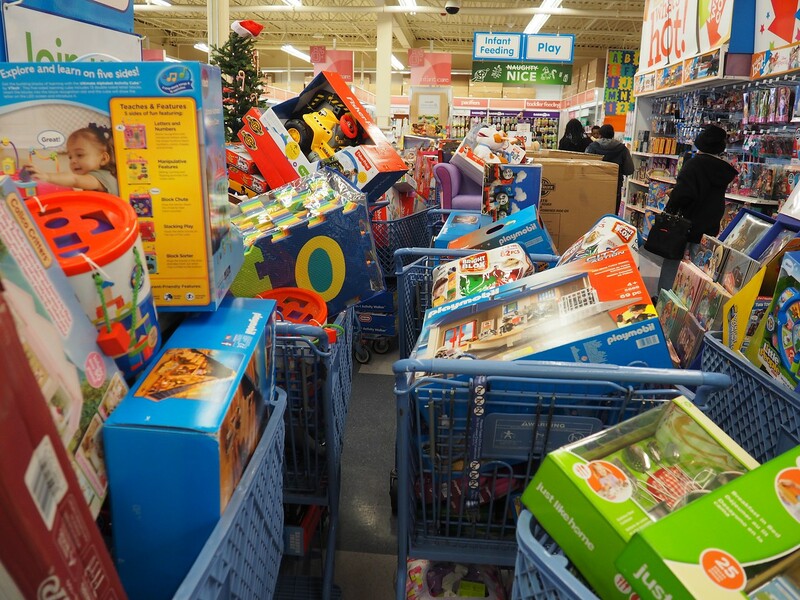 When all was said and done this year, we spent $28,750.94 purchasing toys and donating them directly. Joey made a time-lapse video of shopping and checking out that we’ve included below. This is how fast it feels like we’re actually moving at some points during the day. That left us with $23,749.93 remaining to donate to Toys for Tots. 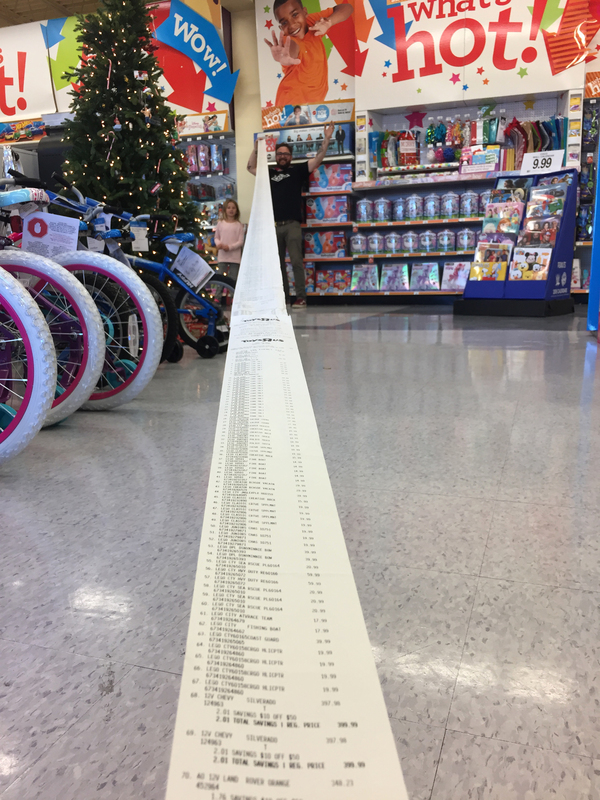 We know that if we were to simply write a check to Toys for Tots in that amount they would allocate the funds accordingly to places where it’s needed most. 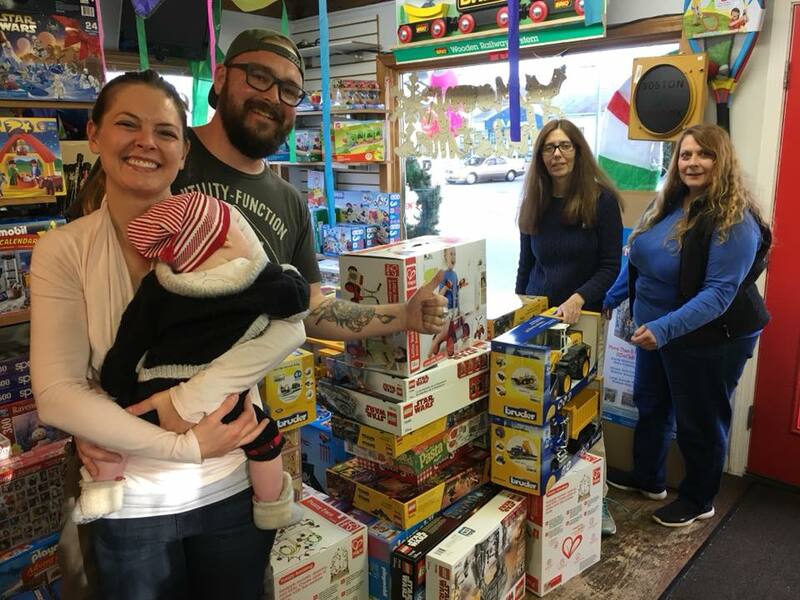 However, community—both in the local and larger sense—has always been an important part of the Cypop for Tots fundraiser, and with so many donations coming in from around the country (and indeed, some outside of the country too) there’s something special about knowing which communities received the extra boost. 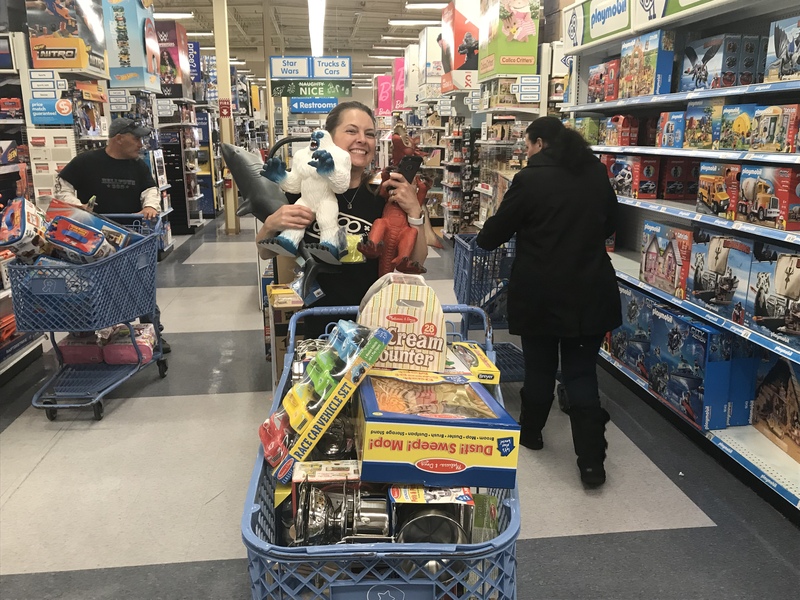 Because of the growth and visibility of this fundraiser, Luc was able to connect with the Vice President of Operations for Marine Toys for Tots this year, and he gave us the names of towns across the country that were behind the national average in fundraising. We also spoke to our good friend and Toys for Tots organizer back in Albuquerque, First Sgt. John Finney, who gave us the name of a town out in New Mexico that needed some help this year. At the publishing of this blog post, the remaining $23,749.93 has been donated to Jackson, MS, Omaha, NE, Milwaukee, WI, Woodland, CA, and Truth or Consequences, NM. One of the reasons we love Toys for Tots is that 97% of all monetary donations go directly to the program, with only 3% of donations being spent on overhead. And, not one dollar donated goes toward paying employee salaries. As far as non-profits go, that’s just about as good as it gets. To everyone who donated to our Cypop for Tots fundraiser, thank you. With so many life changes this year, we honestly weren’t sure whether we would be able to rally and make this happen. We continue to be amazed and humbled by your generosity and know that we couldn’t do any of this without you.